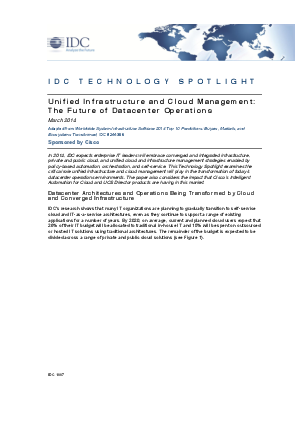 In 2014, IDC expects enterprise IT leaders will embrace converged and integrated infrastructure, private and public cloud, and unified cloud and infrastructure management strategies enabled by policy-based automation, orchestration, and self-service. This Technology Spotlight examines the critical role unified infrastructure and cloud management will play in the transformation of today's datacenter operations environments. The paper also considers the impact that Cisco's Intelligent Automation for Cloud and UCS Director products are having in this market.